Here is a new DIY project for you to try. It is a DIY Moon and Star Pillow, a perfect decor piece for your bed. Please note that if you know how to sew, then go ahead and sew your moon and star pillow. Sewing it allows you to machine wash it. Another option is to use machine washable fabric glue. Also, if you are not old enough to use a hot glue gun or sharp scissors, please ask an adult for help! Thanks so much for stopping by. Be sure to subscribe to my YouTube channel to watch future DIY Videos! If you made a moon and star pillow, please send me a picture of it to my Instagram/Twitter/FB @JuneBeautique)! I would love to feature in my next DIY video! 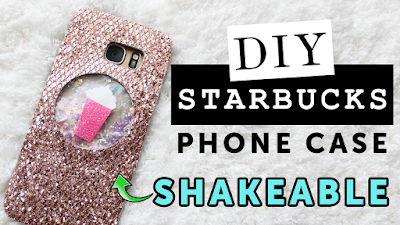 DIY Starbucks Phone Case - SHAKEABLE!